made of aluminium paper and paint. 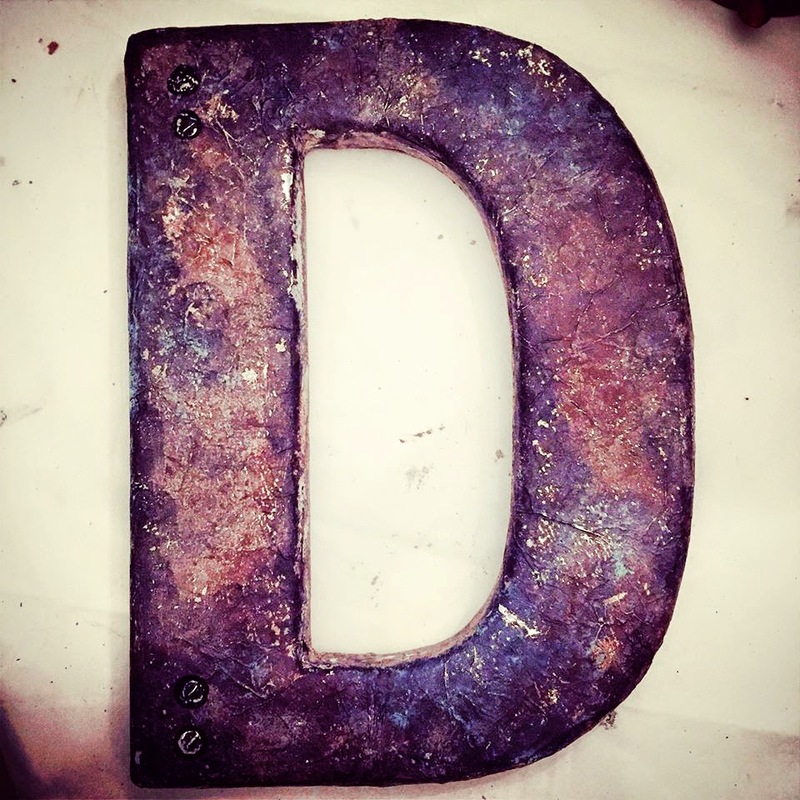 This weathered metal letter isn't really rusted, its not even metal for that matter... it's just a plastic letter I bought at Michaels for $3 bucks but you couldn't tell until you pick it up and realize how light in weight it is. * My letter, plastic, foam, wood or cardboard... It doesn't matter!... 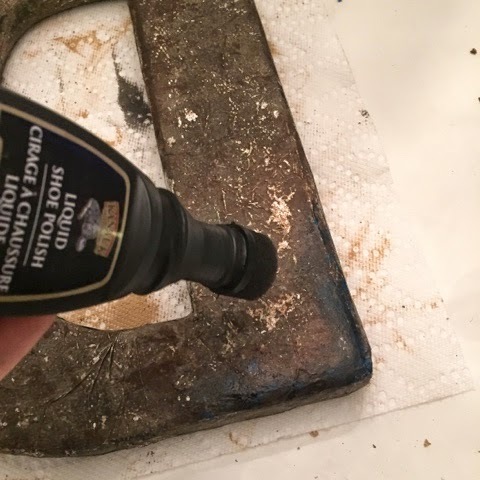 This technique will work on most surfaces, trust me! 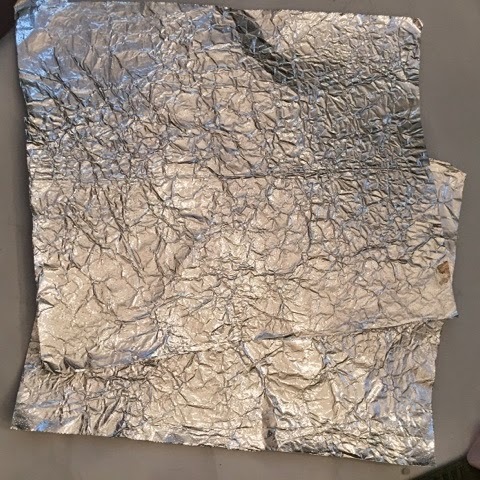 * Aluminum Foil paper... 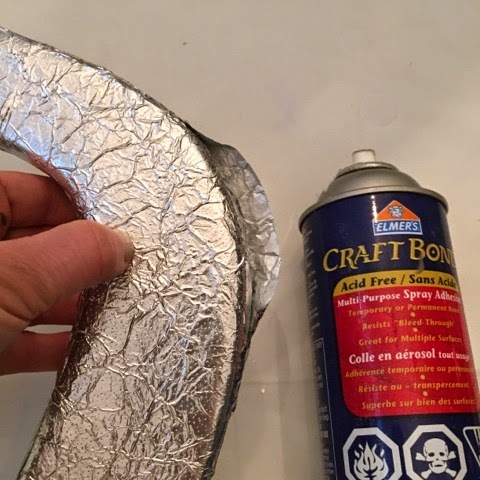 Your regular, everyday, kitchen aluminium foil paper will do, rolled or sheets. 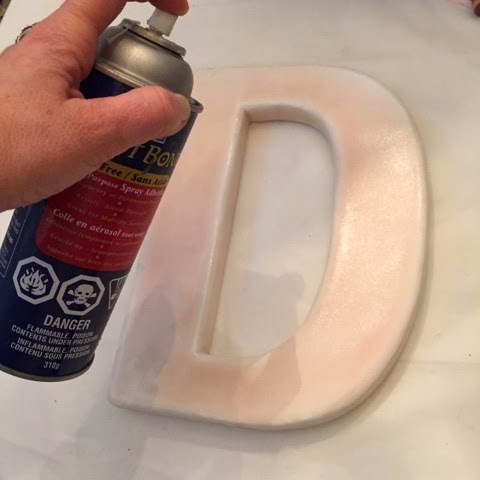 * Spray glue (dries faster) but you can use whatever works for you according to the material of your letter. * Black Shoe polish... The sponge tip type. 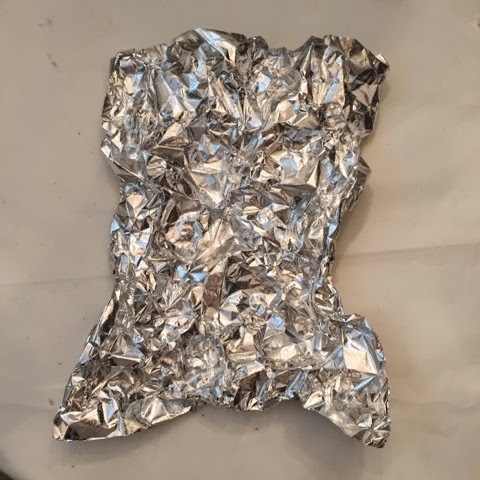 Great for foil projects!! * Craft paint in beige or tan, blue and green. 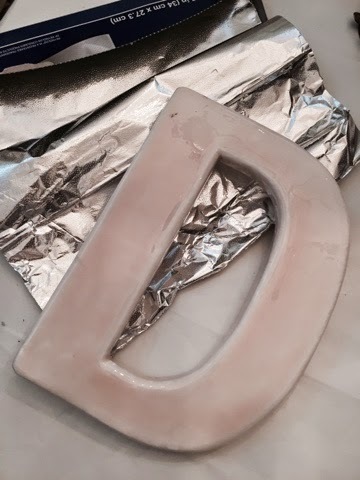 This is how my plastic letter looked like before I started. 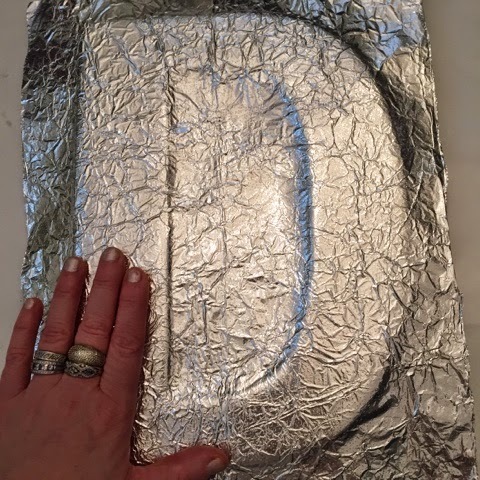 I cut two pieces of foil paper big enough to cover the letter, one piece for the front and the other for the back. I scrunched the paper to create wrinkles that will latter become the realistic texture of corroded metal that I'm after. Be careful not to rip the paper at this point, ok? 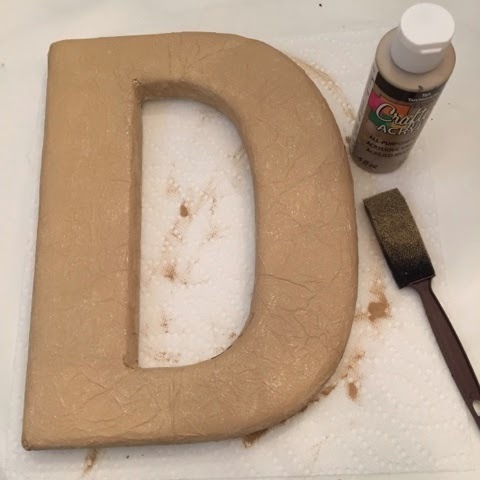 Ok, my sheets are now ready to be glued on to the letter. 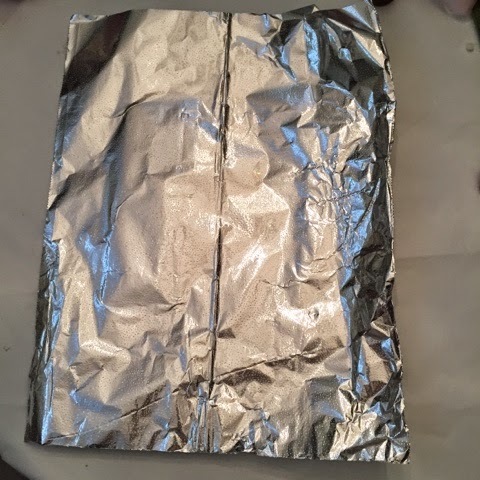 I placed one of my wrinkled foil sheets on top pressing hard enough to create contact between the foil and the plastic of my letter avoiding air bubbles but not smoothing my precious wrinkles. I then. 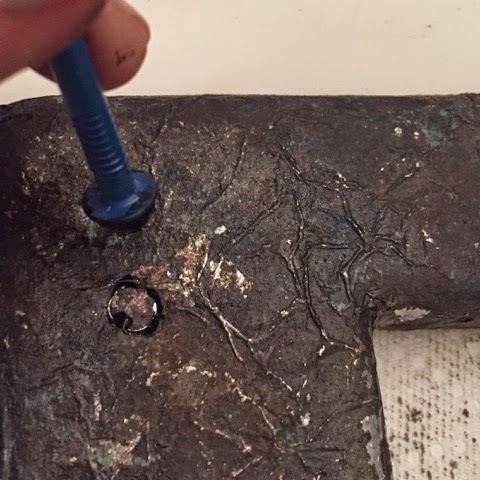 Made an incision on the foil paper allowing the inside of the letter to receive the paper making sure it covered asu h as possible. At this point you'll have some uncovered areas that will easily be patched up latter on. At the end, I covered most of it and I patched the gaps latter. I turned my letter over and repeated the process the exact same way as with the front. 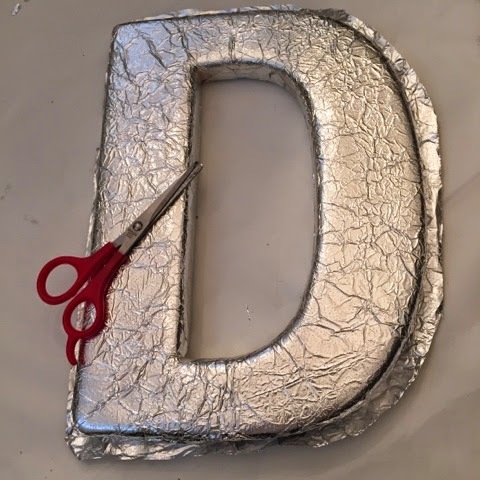 I ended up with a "tab" of extra foil paper so I cut the excess leaving enough hot glue it neatly to the edges of the letter. 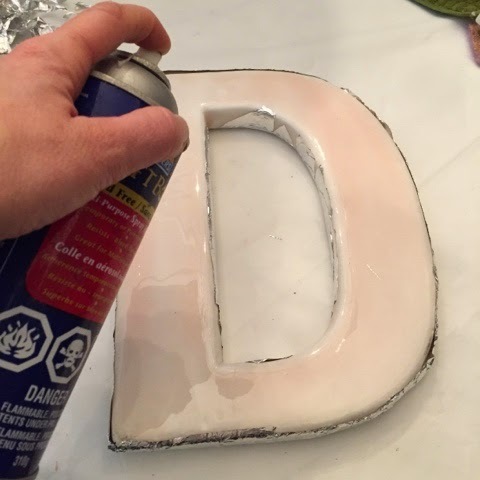 For this part I also used spray glue but you can use hot glue, elders glue... It's up to you as long as it glues it firmly! 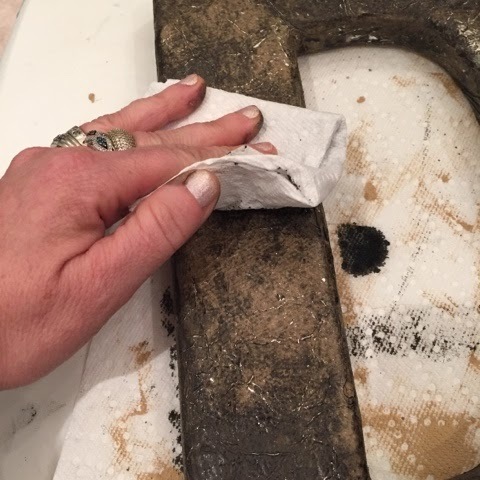 This is where I took the extra time to patch up those gaps... 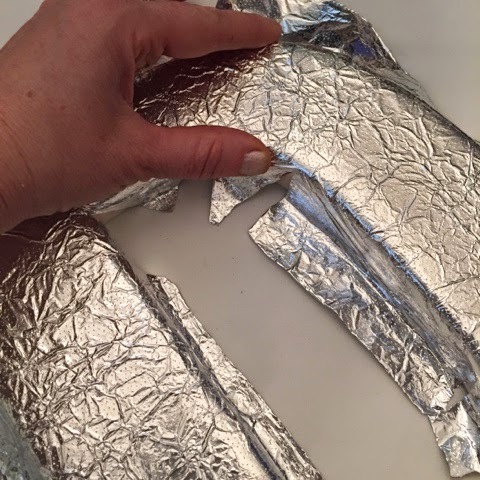 I cut small pieces of foil and glue them inconspicuously... very easy! And now, the fun part!! 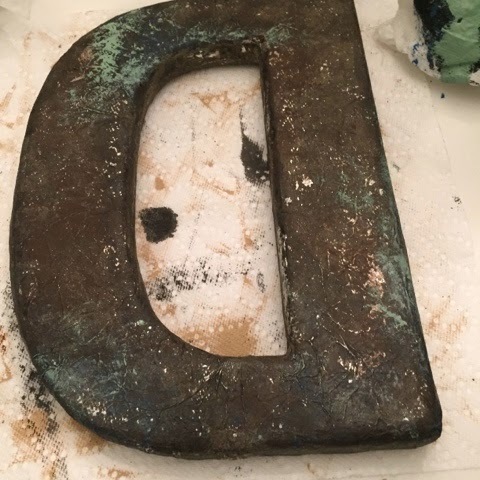 I painted the entire letter, back and front, with cheap craft paint. I used the first beige I found, not picky its just a base colour. And I let it dry for about 2 hours. 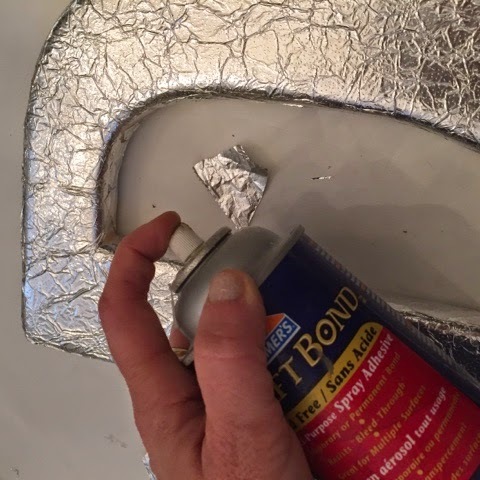 It took long because the foil is not a Porous surface so the paint had no way to be absorbed just air dry. This is when the metal look happens!! 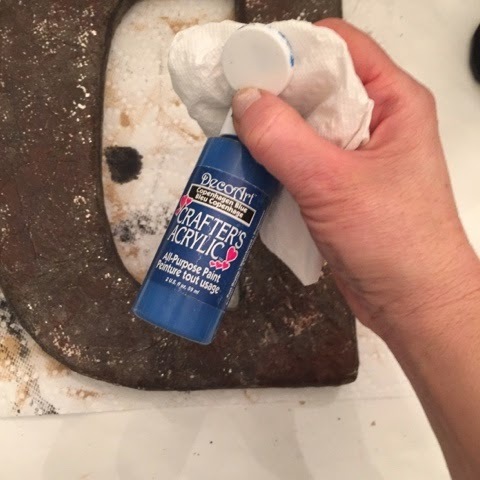 Paint your beige letter with dark shoe polish and be generous on the ink... Don't smudge it or rub it or you'll be removing your beige paint of the foil, simply brush it on smoothly over the surface and watch the magic happen. 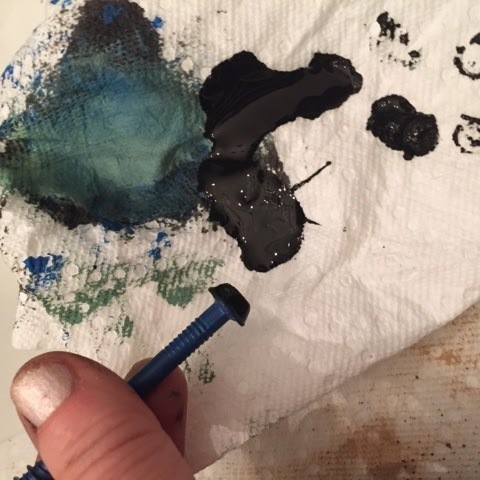 Dry any excess shoe polish ink with a paper towel but do this sporadically not uniformly. 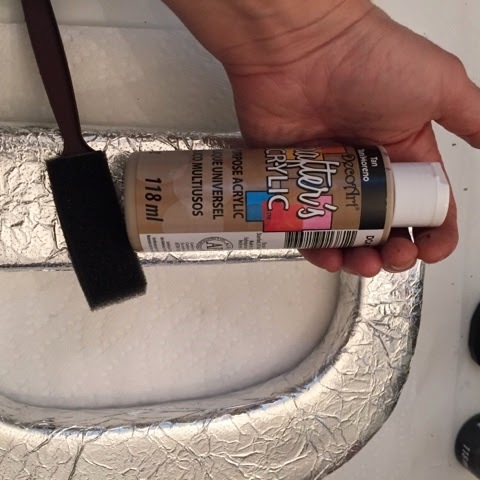 You want to create patches of dark and light areas. 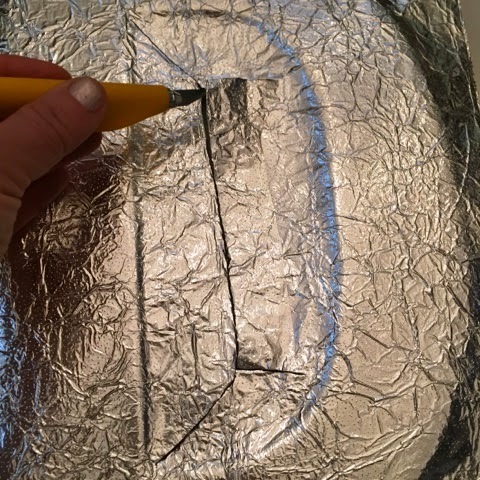 Some of the paint will come off and you'll end up with small patches of foil showing through, that's perfect! 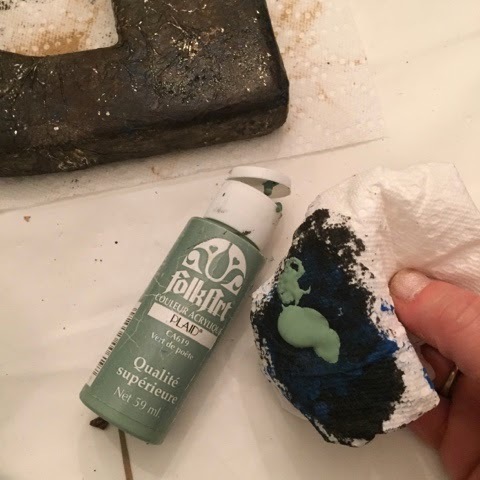 now you have to add on the corroded look by experimenting with colour paint, I used blue and green because in my mind, these are the colours of natural patinas occurring on real metals but you can use other colours such as, orange ( for a more rusted feel) or copper... its up to you! 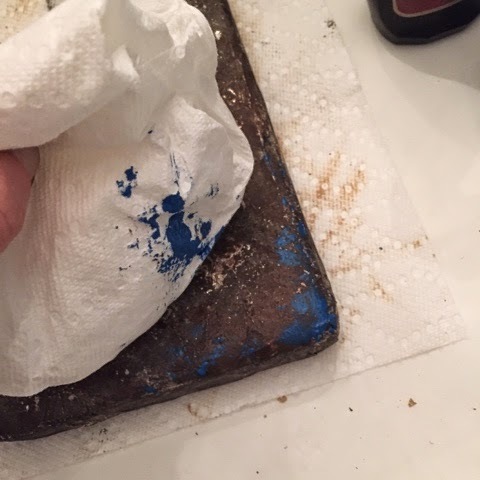 For this technique I only use a very small amount of paint on a paper towel, I dab it on and then painted over it with the shoe polish to darken it a bit. I did the same with the green paint. and I played around with the green until I got the look I was after. 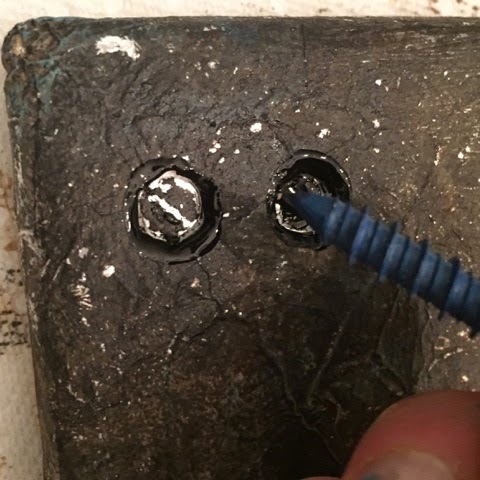 paint it the corner of my letter in two places to resemble real screw holes on metal. I also scratched off a diagonal line revealing some silver foil making it look like the screw driver's line. 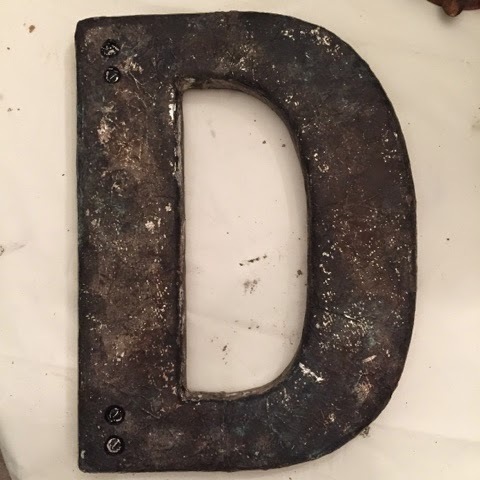 I'll be using this letter as a decorating prop for an upcoming event Styling gig as I will be dressing up a theme dessert table for a 50th Birthday Celebration, the host's name... Dave. Profession... he's a contractor! I hope you liked this project. Please leave me a comment, I'd love to hear from you!! This is so cool. I'm going to try this on a funky twirly lamp base. Thanks for this great idea! Cool!! Dont Forget to show us the results!! How fun and so very realistic. Great job!! Thanks!! 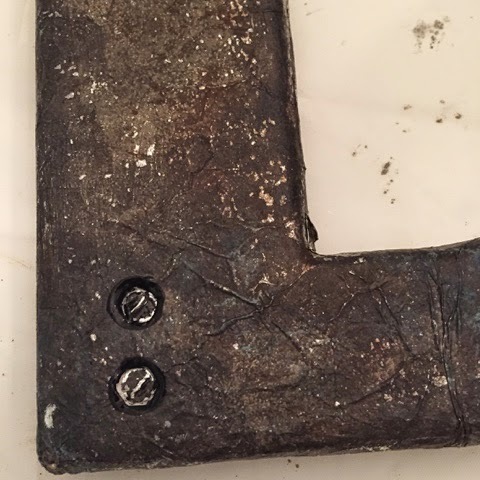 My son saw it on my studio and picked it up thinking it was real iron.... When he realize it was plastic he couldn't believe it... Hahaha!! 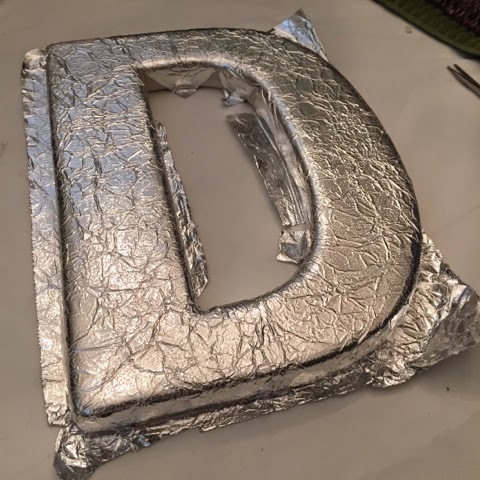 I have a cardboard letter I've been wanting to do something with. 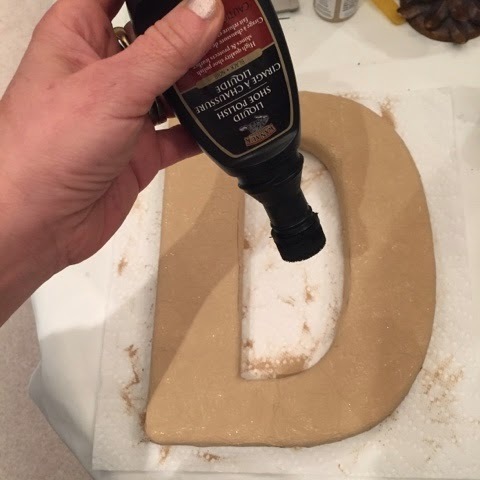 Think I'll try this technique. Thanks for sharing. It was a lot fun, you'll love it! 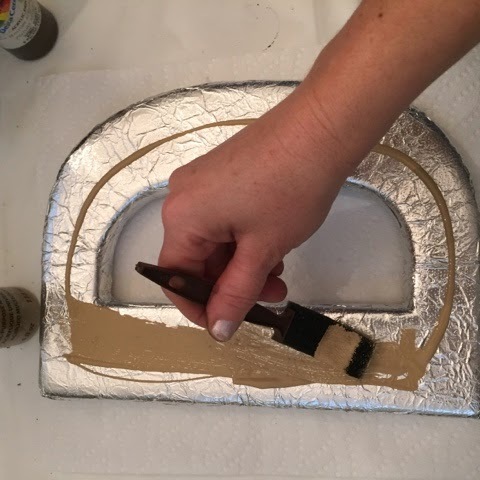 Love this, I have done something similar using foil tape, and washable markers, this looks great and less exspensive and less time consuming. Great. GREAT Job!!! I'm going to do this for sure. Thanks so much and good luck with your project... you're gonna love making these!! Great ideas all around - love your creativity! 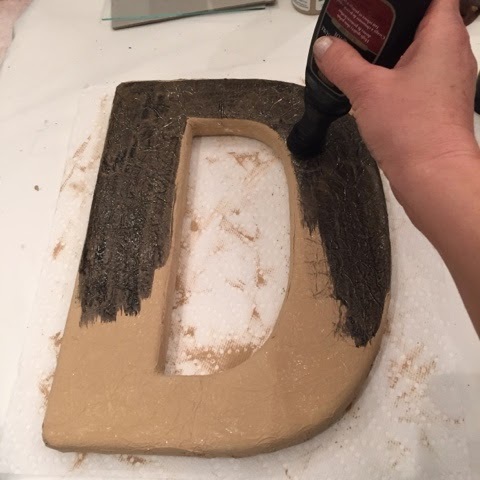 I have done something similar using brown paper, white elmers glue using flame to burn/bubble it, then black and gold paint to antique it.